A pest-control expert had to confront his arachnophobia to remove a venomous female black widow spider and her eggs from a Norfolk business. 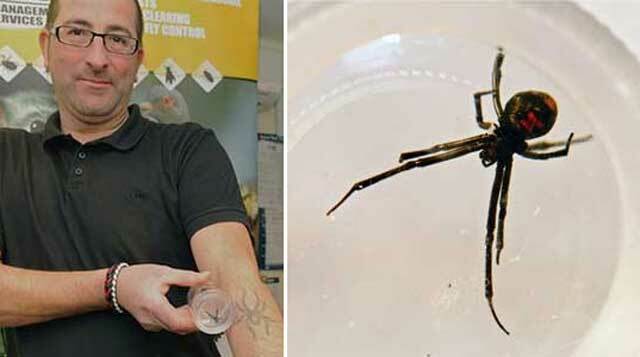 Staff at the unnamed company near Great Yarmouth called pest controllers for help saying they had trapped "a nasty looking spider" under a glass tumbler. The spider was removed and about 100 spiderlings hatched on Wednesday. Ian Parkinson, 45, from Gorleston, said: "I really don't like spiders so I was a bit shaky." The former Royal Navy mine clearer added: "She was quite actively crawling round the glass and I had to coax her into one of our insect jars while making sure not to get bitten. The egg sack only hatched this morning - I turned around and saw black widow spiders crawling around the container. "We can't keep them and we can't risk them escaping so we've been advised by the zoo community to euthanise them by freezing." It is thought the spider had arrived in a load of crates from Texas. A pesticide was used to kill any other spiders at the location. Mr Parkinson has feared spiders since he was a child and as part of "self-help" therapy had a spider tattooed on his arm. He said: "The tattoo was my own way of dealing with them as it's not good for a grown man to scream at a spider. I regret it now, but that's why it's there. The black widow was my ultimate challenge. It was a really big thing for me and I'm really proud I did it. It was the perfect way to conquer my fear.". The female black widow spider is about 1.5in (38mm) long and can live up to three years in the wild. Here in the west of Ireland spiders are considered lucky. Many won't kill them if they find them in a house. Myself, I have a rule, if its in the house I can kill it. If its outside I leave it alone. When I lived in Los Angeles I would have the occasional black widow spider in the house. Waking up with your hand over the edge of the couch not three inches from a black widow is not nice, but they just got a smack from the shoe and no need to call anyone. In the UK tiny, little spiders are often known as money spiders and are supposed to bring you good luck. I've never encountered a proper, dangerous spider, but I approve of your house rule, Steve! Anything that has more than two legs in my house gets killed. I was bitten by a black widow many years ago. My arm swelled up, I felt dizzy, and couldn't see properly. Fortunately, the effects didn't last long. Anonymous, Remind me never to drop by for a visit with the dog. Barbwire, A stupid question but did the bite hurt? I don't mind house spiders in the least. But if there's a garden spider in the house it gets dumped out on it spinneret-ey arse. We left it to tootle about the house.